Persistence Market Research offers an 8-year forecast for the global IoT managed services market between 2018 and 2026. In terms of value, the IoT managed services market is expected to register a CAGR of 20.3% during the forecast period. This study demonstrates the dynamics and trends of the IoT managed services market globally across regions, such as North America, Latin America, Europe, SEA & Other APAC, Japan, China, and Middle East & Africa, along which their influence on the current nature and future status of the global IoT managed services market over the forecast period. A detailed analysis has been provided for every segment in terms of market size analysis for IoT managed services across different regions. It provides a market outlook for 2018–2026, and sets the forecast within the context of IoT, which includes the latest technological developments as well as service offerings in the market. This study discusses key trends within regions contributing to the growth of the market, as well as analyzes degrees at which drivers are influencing this market in regions. Key regions and countries assessed in this report include North America (U.S. and Canada), Latin America (Brazil, Mexico, and Rest of Latin America), Europe (Germany, Italy, France, U.K., Spain, Russia, and Rest of Europe), SEA & Other APAC (India, Indonesia, Philippines, Thailand, Malaysia, Oceania, and Rest of SEA), Japan, China, and Middle East and Africa (GCC countries, South Africa , Turkey, Northern Africa, and Rest of MEA). This report evaluates the present scenario and the growth prospects of the IoT managed services market across various regions globally for the period 2018 –2026. We have considered 2017 as the base year, and provided data for the remaining 12 months. The forecast presented here assesses the total revenue by value across the market. To offer an accurate forecast, we started by sizing the current market, which forms the basis of how the IoT managed services market will develop in the future. Given the characteristics of the market, we triangulated the outcome of different services & components, and analyzed based on technology trends. IoT is a 24*7 network of interconnected objects that are able to collect and exchange data using embedded sensors and mobile devices, among others. A connected device can become “smart” by combining sensors, networks, applications, etc., which come together to create added intelligence. The applications of IoT can be found in several industries today, such as manufacturing, healthcare, transport & logistics, government, retail, and energy & utility, among others. Managed service is the practice of outsourcing a dedicated team to handle defined responsibilities, to cut down the cost, and manage operations effectively. The IoT managed services market is highly dependent upon the adoption of IoT among industries. 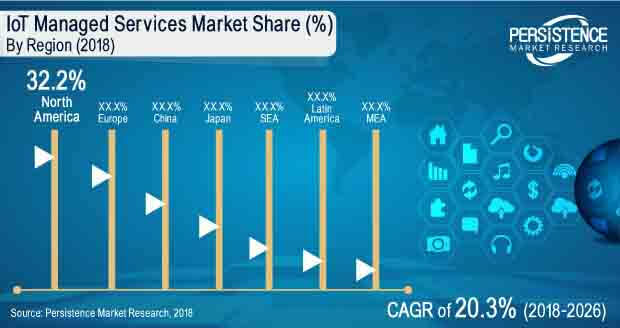 The IoT managed services market is divided into five segments on the basis of services: security management services, network management services, infrastructure management services, device management services, and data management services. The factors driving the global IoT managed services market are the adoption of IoT across the industry, rising managed cloud services, and increasing government investments in projects such as smart cities, among others. Revenue generated by the global IoT managed services market is estimated to exhibit a double-digit CAGR, and hence, reach US$ 94.3 Bn by 2026. On the basis of IoT managed services type, the network management segment is estimated to hold the largest share of the IoT managed services market in 2026. On the basis of industry, the manufacturing IoT managed services segment is estimated to hold approximately 27.5% of the market share in 2026. However, the healthcare sector in the IoT managed services market is expected to project the highest CAGR in 2018-2026. On the basis of the IoT managed services segment, the infrastructure management services segment is estimated to exhibit a CAGR of 20.3% during the forecast period. The IoT managed services market in South East Asia is expected to witness the highest growth in the global market owing to the increasing development of smart cities and increasing ICT spending across industries, complemented by the growth of these industries in the region. Some popular vendors contributing to the IoT managed services market are Cognizant Technology Solutions Corporation, Tech Mahindra, Cisco Systems Inc., Oracle, IBM Corporation, Accenture, HCL Technologies Limited, Microsoft Corporation, Honeywell International Inc., and Google LLC, among others. In August 2016, Tech Mahindra entered into a partnership with Telit to develop complete solutions for IoT. In March 2017, IBM Corporation entered into a partnership with AT&T, a telecommunication company, to provide better solutions and services for IoT and data analytics to enterprises.